For the book also known as Laozi, see Tao Te Ching. Laozi (UK: /ˈlaʊˈzɪə/; US: /ˈlaʊˈtsiː/; Chinese: 老子; literally "Old Master"), also rendered as Lao Tzu (/ˈlaʊˈtsuː/ or /ˈlaʊˈdzʌ/) and Lao-Tze (/ˈlaʊˈdzeɪ/), was an ancient Chinese philosopher and writer. He is the reputed author of the Tao Te Ching, the founder of philosophical Taoism, and a deity in religious Taoism and traditional Chinese religions. A semi-legendary figure, Laozi was usually portrayed as a 6th-century BC contemporary of Confucius, but some modern historians consider him to have lived during the Warring States period of the 4th century BC. A central figure in Chinese culture, Laozi is claimed by both the emperors of the Tang dynasty and modern people of the Li surname as a founder of their lineage. Laozi's work has been embraced by both various anti-authoritarian movements and Chinese Legalism. In traditional accounts, Laozi's personal name is usually given as Li Er (李耳, Old *rəʔ nəʔ, Mod. Lǐ Ěr) and his courtesy name as Boyang (trad. 伯陽, simp. 伯阳, Old *Pˤrak-lang, Mod. Bóyáng). A prominent posthumous name was Li Dan (李聃, Lǐ Dān). Laozi itself is a honorific title: 老 (Old *rˤu ʔ, "old, venerable") and 子 (Old *tsəʔ, "master"). It has been romanized numerous ways, sometimes leading to confusion. The most common present form is Laozi or Lǎozǐ, based on the Hanyu Pinyin system adopted by Mainland China in 1958 and by Taiwan in 2009. During the 20th century, Lao-tzu was more common, based on the formerly prevalent Wade–Giles system. In the 19th century, the title was usually romanized as Lao-tse. Other forms include the variants Lao-tze and Lao-tsu. As a religious figure, he is worshipped under the name "Supreme Old Lord" (太上老君, Tàishàng Lǎojūn) and as one of the "Three Pure Ones." During the Tang dynasty, he was granted the title "Supremely Mysterious and Primordial Emperor" (太上玄元皇帝, Tàishàng Xuānyuán Huángdì). 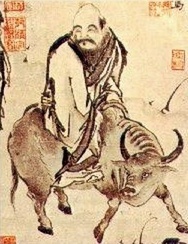 According to Chinese legend, Laozi left China for the west on a water buffalo. In the mid-twentieth century, a consensus emerged among scholars that the historicity of the person known as Laozi is doubtful and that the Tao Te Ching was "a compilation of Taoist sayings by many hands". Alan Watts urged more caution, holding that this view was part of an academic fashion for skepticism about historical spiritual and religious figures and stating that not enough would be known for years – or possibly ever – to make a firm judgment. The earliest certain reference to the present figure of Laozi is found in the 1st‑century BC Records of the Grand Historian collected by the historian Sima Qian from earlier accounts. In one account, Laozi was said to be a contemporary of Confucius during the 6th or 5th century BC. His surname was Li and his personal name was Er or Dan. He was an official in the imperial archives and wrote a book in two parts before departing to the west. In another, Laozi was a different contemporary of Confucius titled Lao Laizi (老莱子) and wrote a book in 15 parts. In a third, he was the court astrologer Lao Dan who lived during the 4th century BC reign of Duke Xian of the Qin Dynasty. The oldest text of the Tao Te Ching so far recovered was written on bamboo slips and dates to the late 4th century BC; see Guodian Chu Slips. According to traditional accounts, Laozi was a scholar who worked as the Keeper of the Archives for the royal court of Zhou. This reportedly allowed him broad access to the works of the Yellow Emperor and other classics of the time. The stories assert that Laozi never opened a formal school but nonetheless attracted a large number of students and loyal disciples. There are many variations of a story retelling his encounter with Confucius, most famously in the Zhuangzi. Many clans of the Li family trace their descent to Laozi, including the emperors of the Tang dynasty. This family was known as the Longxi Li lineage (隴西李氏). According to the Simpkinses, while many (if not all) of these lineages are questionable, they provide a testament to Laozi's impact on Chinese culture. The third story in Sima Qian states that Laozi grew weary of the moral decay of life in Chengzhou and noted the kingdom's decline. He ventured west to live as a hermit in the unsettled frontier at the age of 80. At the western gate of the city (or kingdom), he was recognized by the guard Yinxi. The sentry asked the old master to record his wisdom for the good of the country before he would be permitted to pass. The text Laozi wrote was said to be the Tao Te Ching, although the present version of the text includes additions from later periods. In some versions of the tale, the sentry was so touched by the work that he became a disciple and left with Laozi, never to be seen again. In others, the "Old Master" journeyed all the way to India and was the teacher of Siddartha Gautama, the Buddha. Others say he was the Buddha himself. The story of Laozi has taken on strong religious overtones since the Han dynasty. As Taoism took root, Laozi was worshipped as a god. Belief in the revelation of the Tao from the divine Laozi resulted in the formation of the Way of the Celestial Masters, the first organized religious Taoist sect. In later mature Taoist tradition, Laozi came to be seen as a personification of the Tao. He is said to have undergone numerous "transformations" and taken on various guises in various incarnations throughout history to initiate the faithful in the Way. Religious Taoism often holds that the "Old Master" did not disappear after writing the Tao Te Ching but rather spent his life traveling and revealing the Tao. Taoist myths state that Laozi was conceived when his mother gazed upon a falling star. He supposedly remained in her womb for 62 years before being born while his mother was leaning against a plum tree. (The Chinese surname Li shares its character with "plum".) Laozi was said to have emerged as a grown man with a full grey beard and long earlobes, both symbols of wisdom and long life. Other myths state that he was reborn 13 times after his first life during the days of Fuxi. In his last incarnation as Laozi, he lived nine hundred and ninety years and spent his life traveling to reveal the Tao. Laozi is traditionally regarded as the author of the Tao Te Ching (Daodejing), though the identity of its author(s) or compiler(s) has been debated throughout history. It is one of the most significant treatises in Chinese cosmogony. As with most other ancient Chinese philosophers, Laozi often explains his ideas by way of paradox, analogy, appropriation of ancient sayings, repetition, symmetry, rhyme, and rhythm. In fact, the whole book can be read as an analogy – the ruler is the awareness, or self, in meditation and the myriad creatures or empire is the experience of the body, senses and desires. The Tao Te Ching, often called simply Laozi after its reputed author, describes the Dao (or Tao) as the source and ideal of all existence: it is unseen, but not transcendent, immensely powerful yet supremely humble, being the root of all things. People have desires and free will (and thus are able to alter their own nature). Many act "unnaturally", upsetting the natural balance of the Tao. The Tao Te Ching intends to lead students to a "return" to their natural state, in harmony with Tao. Language and conventional wisdom are critically assessed. Taoism views them as inherently biased and artificial, widely using paradoxes to sharpen the point. Wu wei (無爲), literally "non-action" or "not acting", is a central concept of the Tao Te Ching. The concept of wu wei is multifaceted, and reflected in the words' multiple meanings, even in English translation; it can mean "not doing anything", "not forcing", "not acting" in the theatrical sense, "creating nothingness", "acting spontaneously", and "flowing with the moment." Laozi is traditionally regarded as the founder of Taoism, intimately connected with the Tao Te Ching and "primordial" (or "original") Taoism. Popular ("religious") Taoism typically presents the Jade Emperor as the official head deity. Intellectual ("elite") Taoists, such as the Celestial Masters sect, usually present Laozi (Laojun, "Lord Lao") and the Three Pure Ones at the top of the pantheon of deities. Laozi was a proponent of limited government. Left-libertarians in particular have been influenced by Laozi – in his 1937 book Nationalism and Culture, the anarcho-syndicalist writer and activist Rudolf Rocker praised Laozi's "gentle wisdom" and understanding of the opposition between political power and the cultural activities of the people and community. In his 1910 article for the Encyclopædia Britannica, Peter Kropotkin also noted that Laozi was among the earliest proponents of essentially anarchist concepts. More recently, anarchists such as John P. Clark and Ursula K. Le Guin have written about the conjunction between anarchism and Taoism in various ways, highlighting the teachings of Laozi in particular. In her rendition of the Tao Te Ching, Le Guin writes that Laozi "does not see political power as magic. He sees rightful power as earned and wrongful power as usurped... He sees sacrifice of self or others as a corruption of power, and power as available to anyone who follows the Way. No wonder anarchists and Taoists make good friends." The right-libertarian economist Murray Rothbard suggested that Laozi was the first libertarian, likening Laozi's ideas on government to Friedrich Hayek's theory of spontaneous order. James A. Dorn agreed, writing that Laozi, like many 18th-century liberals, "argued that minimizing the role of government and letting individuals develop spontaneously would best achieve social and economic harmony." Similarly, the Cato Institute's David Boaz includes passages from the Tao Te Ching' in his 1997 book The Libertarian Reader. Philosopher Roderick Long, however, argues that libertarian themes in Taoist thought are actually borrowed from earlier Confucian writers. ^ a b "Lao Zi". Collins English Dictionary. ^ "Lao-tzu". Random House Webster's Unabridged Dictionary. ^ "Lao Tzu". American Heritage Dictionary of the English Language, Fifth Edition. Houghton Mifflin Company, 2016. ^ "Laotze". Collins English Dictionary. ^ "Lao-tzu – Founder of Taoism". www.en.hubei.gov.cn. Government of Hubei, China. Retrieved 15 November 2018. ^ a b "Laozi". Stanford Encyclopedia of Philosophy by Stanford University. 2018. The discovery of two Laozi silk manuscripts at Mawangdui, near Changsha, Hunan province in 1973 marks an important milestone in modern Laozi research. The manuscripts, identified simply as "A" (jia) and "B" (yi), were found in a tomb that was sealed in 168 BC. The texts themselves can be dated earlier, the "A" manuscript being the older of the two, copied in all likelihood before 195 BC. Until recently, the Mawangdui manuscripts have held the pride of place as the oldest extant manuscripts of the Laozi. In late 1993, the excavation of a tomb (identified as M1) in Guodian, Jingmen city, Hubei province, has yielded among other things some 800 bamboo slips, of which 730 are inscribed, containing over 13,000 Chinese characters. 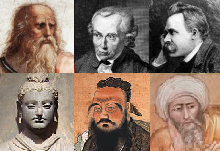 Some of these, amounting to about 2,000 characters, match the Laozi. The tomb...is dated around 300 BC. ^ Han Fei Tzu, the paradigm legalist, wrote one of the earliest commentaries on the Lao Tzu (cf. University of Hong Kong page). ^ a b c d Baxter, William; Sagart, Laurent (2014-09-20). "Baxter–Sagart Old Chinese Reconstruction" (PDF). Retrieved 2018-05-01. ^ a b c Franz, Alex et al. ed. Google corpus. 2008. Accessed 17 Jan;2014. ^ Xinhua News Agency. "Pinyin celebrates 50th birthday". 11 Feb 2008. Accessed 20 Sept 2008. ^ Taipei Times. "Hanyu Pinyin to be standard system in 2009". 18 Sept 2008. Accessed 20 Sept 2008. ^ "Lao Zi and the Canon of Virtue". sacu.org. ^ "Lao Tzu (Lao Zi) Scroll Paintings and Posters". Edepot.com. Retrieved 2013-02-15. ^ a b Woolf, Greg (2007). Ancient civilizations: the illustrated guide to belief, mythology, and art. Barnes & Noble. pp. 218–19. ISBN 978-1-4351-0121-0. ^ Hargett, James M. (2006). Stairway to Heaven: A Journey to the Summit of Mount Emei. SUNY Press. pp. 54–. ISBN 978-0-7914-6682-7. ^ "Britannica: Anarchism". Dwardmac.pitzer.edu. Retrieved 2011-11-14. ^ Clark, John P. "Master Lao and the Anarchist Prince". Archived from the original on 2017-10-20. Retrieved 2011-11-01. Dorn, James A. (2008). "Lao Tzu (C. 600 B.C.)". In Hamowy, Ronald. The Encyclopedia of Libertarianism. Thousand Oaks, CA: SAGE; Cato Institute. doi:10.4135/9781412965811.n169. ISBN 978-1-4129-6580-4. LCCN 2008009151. OCLC 750831024. Retrieved May 12, 2010.